If you take classes other than the ones listed on your approved candidacy form, you must file a Course Substitution Form (also known as the Request for Course Substitution in Master’s Degree Program. If you are only changing the semester that you take the course, not the actual course, it is not necessary to submit the form. Note: Students are to upload this form to the substitution form dropbox in the Canvas iSchool Advising and Administration site — do not send this form directly to GAPE. The School of Information will download your Course Substitution Form from Canvas, obtain necessary signatures, and forward it to Graduate Admissions and Program Evaluations (GAPE). You will not receive official approval notification from GAPE. The substitution form will be placed in your file awaiting graduation. Open the Request for Course Substitution in Master’s Degree Program form. Do a FILE/SAVE AS to your computer desktop, and rename as follows: YOURLASTNAME_YOURFIRSTNAME_STUDENTIDNUMBER-sub.pdf. Open this file from your desktop and, using Adobe Reader, TYPE directly into the form you see displayed on your computer screen. SAVE to your desktop/your computer. In Canvas, go to the iSchool Advising and Administration site under Courses. 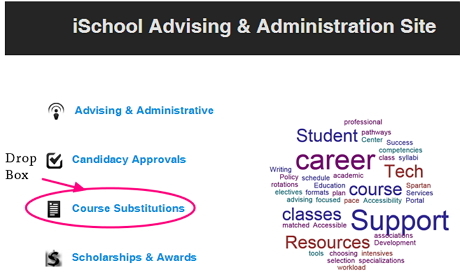 Click on the link for Course Substitutions. On the right, you will see a link to upload submissions. For questions, contact the Student Services Team. Graduation Hold? If you have already completed ALL your final course work, and have been contacted by GAPE after the end of your final semester, requesting that you submit a course substitution form to complete your file in order to be evaluated for degree completion, you may not have access to the iSchool Advising drop box. Graduating students are unenrolled from iSchool Advising one month after their final iSchool class. Send your form directly to our Student Services Coordinator.